Messianic Music, Chanukkah & Unity in Seattle! What an amazing time we had with Joel Chernoff in concert this past Saturday (Dec. 8th). What a great way to start off the Festival of Chanukkah. To be able to worship God together with our two sister congregations, Beit HaShofar and Beit Tikvah, in unity was amazing. It was really a special time of worship before Adonai. Rabbi Jason Forbes led us in Havdallah for the closing of Shabbat. My family and I led the blessing for the first night of Chanukkah. The music, of course, was outstanding thanks to Joel Chernoff. Close to three hundred people came out; many of which danced in a great dance circle. About twenty of our children had their own dance circle thanks to some outstanding women of God who jumped in and helped the kids! The words that describe the event for me are "wonderful, exciting, amazing, and awesome." Of course the entire point was to celebrate our Messiah Yeshua together in unity. For Beit Messiah it was a no-brainer. We belong to both the IAMCS and the UMJC. Beit Tikvah is our sister congregation through the IAMCS and Beit HaShofar is our sister congregation through the UMJC. This was not just about bringing together all/any "Messianic" groups in Seattle. This was about bringing three like-minded Messianic rabbis and their synagogues who are focused on the same purpose: sharing Yeshua with our Jewish people in Seattle in a Jewish way. Our three congregations are different. We do things differently. And this is to our benefit. We are not saying that any of us do Messianic Judaism "right"! We are saying we are three expressions of what Messianic Judaism is! And to come together to celebrate the end of Shabbat, the Festival of Chanukkah, and Messianic Judaism in Seattle was a joy! Special thanks go out to Joel Chernoff, his music was the catalyst for this special night. 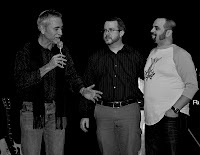 I also want to thank Dan Behrens who did a fantastic job with everything audio/visual. 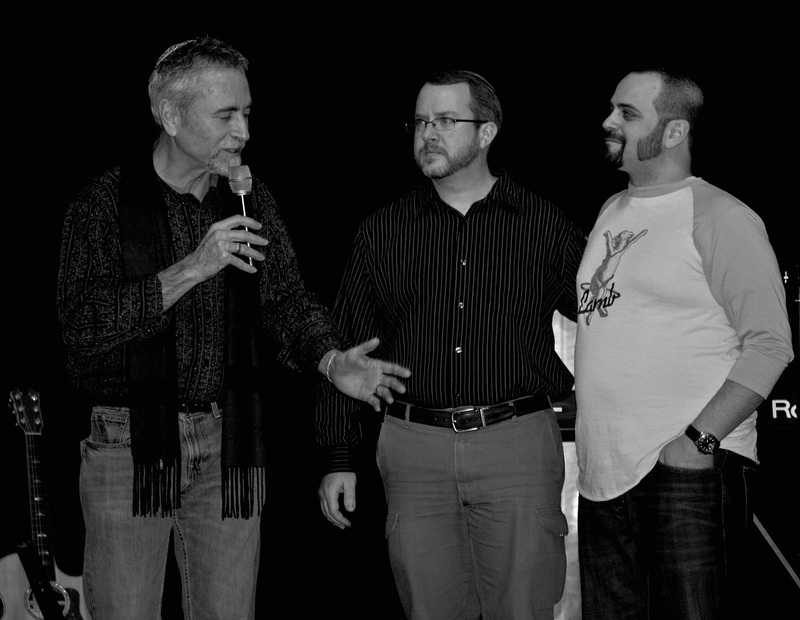 Phil Baxter leading our offering team, Fred Savo leading greeters, Mechele Baird helping me take care of Joel, the people that helped at the merchandise table. Thanks to Dave Petrie getting our Beit Messiah banner waaaaaaay up on the wall, Jennifer Benvenuti for leading all the dancers, Janelle Behrens and her team for setting up coffee and cookies. Thanks to Maryanne Savo and P.K. White for being so detail oriented and making sure the event went smoothly, everyone who helped with set up and break down, North Seattle Alliance Church for their partnership and friendship. Thanks to Rabbi Hylan Slobodkin and Rabbi Jason Forbes for their friendship and co-leading in this event. Thank you to the people from Beit Messiah, Beit HaShofar, and Beit Tikvah and so many other friends who came out and supported this outstanding effort of unity. The end of the event was one of my favorite parts when Rabbi Hylan, Rabbi Jason and I stood on the stage together as representatives of our synagogues. To close the event Rabbi Hylan led us in the Aaronic benediction. Psalm 133:1 says, "Behold, how good and how pleasant it is for brethren to dwell together in unity!" And we did! And it was awesome! If you have pictures from this event please send them to Rabbi@BeitMessiah.com so we can share them! Yeshua means salvation. Yeshu does not. Yahshua means nothing. I believe that Yeshua (Jesus) is the Messiah of Israel. Yeshua literally means "salvation" as in what He supplies to those who believe in Him. In Matthew 1:21 the Gospel reads, "...and you are to give Him the name Yeshua, because He will save His people from their sins.” And He did. And He is. And He will. We, Messianic Jews, do not exist to trick/deceive our Jewish people into Christianity. We are not trying to lure unsuspecting Jews into denying the God of Israel. 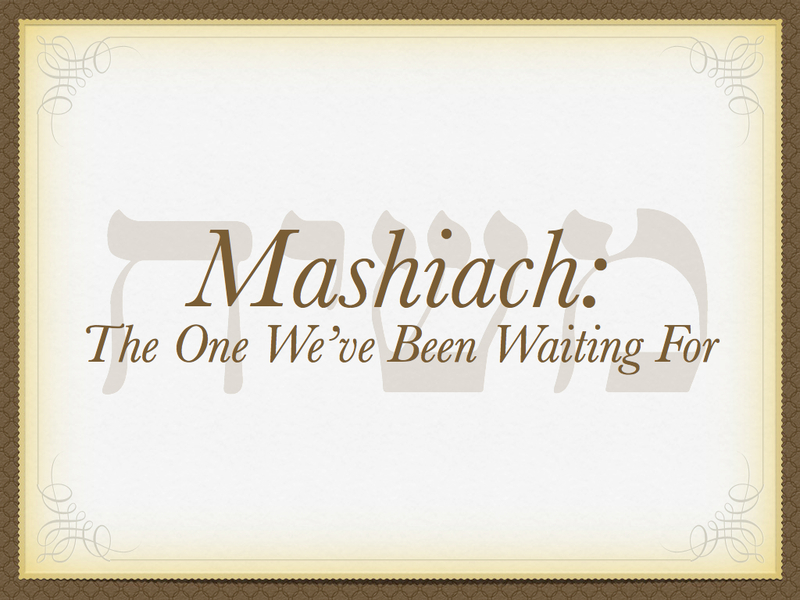 We believe in all sincerity that Yeshua is Who He said He is: the One we've been waiting for -- Mashiach. 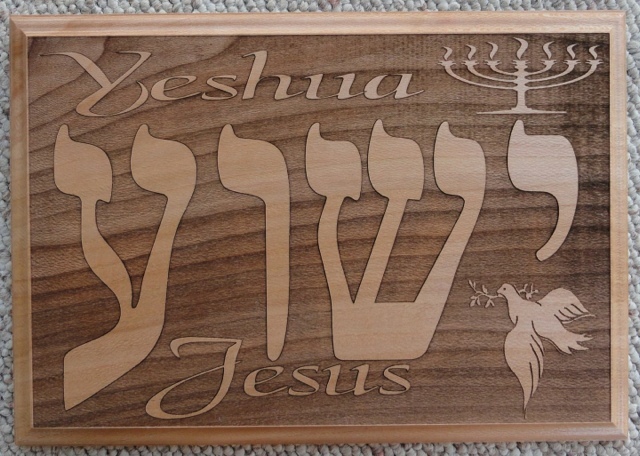 Sometimes the name Yeshu is used by non-Messianic Jews to describe Yeshua. But these names do not mean the same thing. The name "Yeshu" is actually an acronym for the formula (ימח שמו וזכרו(נו (Y'mach Sh'mo V'Zichro) meaning "may his name and memory be obliterated." When non-Messianic Jews use this name, it is an intentionally derogatory name for Yeshua. They treat Yeshua like he is the Voldemort of Judaism -- as in "You-Know-Who" or "He-Who-Must-Not-Be-Named". I get it; they don't believe as I do. I get that what I believe is insulting to some. I understand that non-Messianic Jews would rather I not describe myself as Jewish; and, in fact, believe I am not Jewish. My mother is not Jewish (my dad is). My wife is not Jewish (her husband is). Yet, according to the Torah I still qualify. The truth is I do not follow the rules of orthodoxy and they don't follow my rules either. My last name is Rosenberg. I look like any other kid of Eastern European Jewish descent. I can't help what I am: a Jew who believes in Jesus; a Jew who believes he lives up to the Hebrew name his parents gave him -- Yeshua (Salvation). I am rightfully insulted when non-Messianic Jews refer to Yeshua as Yeshu. In a similar sense some who claim to be Messinaic/"Hebrew Roots" like to use the spelling Yahshua. 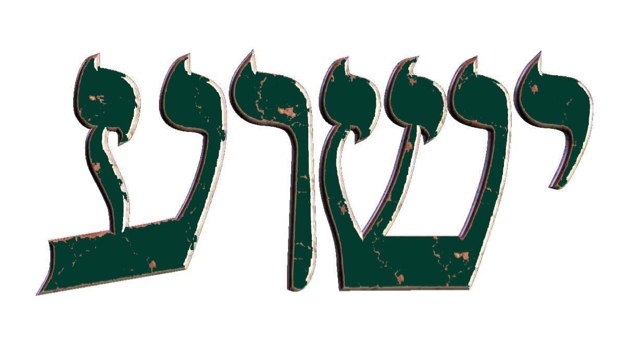 It is an attempt to fit "Yah" into Yeshua's name. I get it. But it doesn't work grammatically and scholars overwhelming reject "Yahshua" as a legit Hebrew name. In English His name is Jesus. In Hebrew His name is Yeshua. He was a real Jewish person Who lived in Israel in the first century. Most can agree here (even Shmuley Boteach). The disagreement is what happened after His life: His death, His resurrection, the over 500 Jewish witnesses who saw Him alive 40 days after He died. I don't believe in Yeshua because I want to freak the rest of my Jewish people out. I'm not trying to trick anyone. I am convinced that Yeshua is the Messiah for Israel and all of the nations – for the whole world. Believing in Him can bring what His actual name promises: salvation, eternity, a life that never ends and which is reunited with the One Who gives life. In my mind there is no greater holiday than Sukkot. 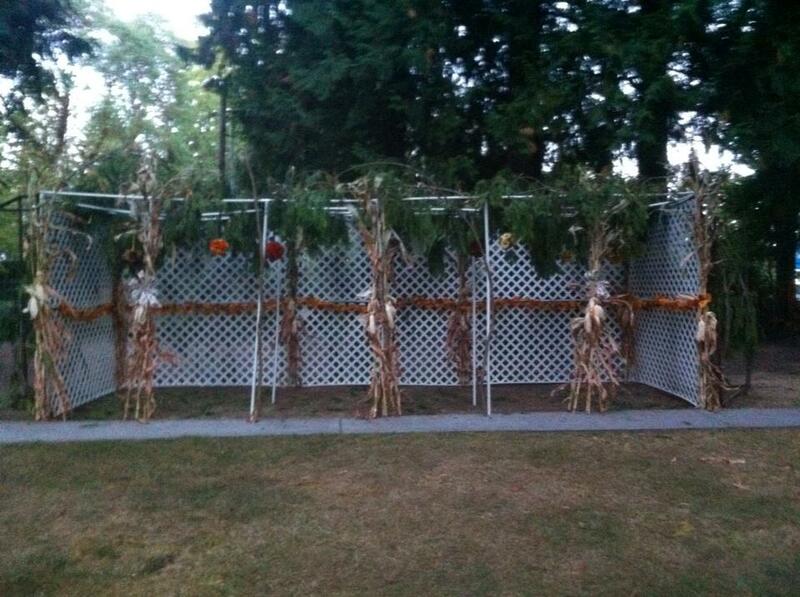 Some of my best childhood memories come from celebrating Sukkot with my family and congregation. Building sukkot (both at home and for the congregation), eating in the sukkah, praying in the sukkah, and sometimes sleeping in the sukkah. In college we built a sukkah every year and in my senior year I got some of my buddies to sleep in it with me until it began to rain. One midrash says, "A man who sleeps in a Sukkah while it is raining is an idiot." We took this to heart and retreated back to our house. I have so many great stories and memories wrapped up in the celebration of this wonderful holiday. Yesterday, I had an awesome experience as I sat in our synagogue's sukkah and wrote my sermon for this coming Shabbat Sukkot. One Rabbi wrote, "there is a midrash that says that sukkot are not buildings at all but the glory of God." And that got me thinking. 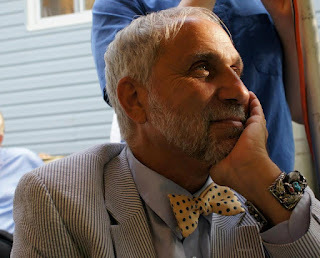 As I sat in the Sukkah, reading and praying, I had the opportunity to sit in the glory of God. 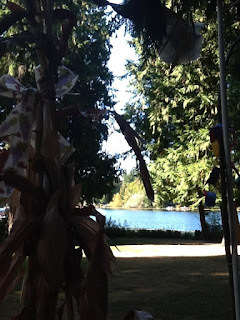 It is easy in our sukkah because it is right by a lake and, though it is getting cold the sound of the leaves, wind, water, birds and corn stalks on our sukkah led me in a quiet peace that I have not experienced in a while. The sukkah is a physical representation of the presence (or glory) of God; to sit in it during Sukkot while reading and praying was to invite God's glory into my life, even if just for a moment. I played "Show Me Thy Glory" by Marty Goetz on my iPad and of course, as only Marty Goetz's music can, I felt the presence of the Lord with me. I know, cheesy right? I agree. But, it was also real. During the middle Shabbat of Sukkot we read Exodus 33-34 (A curious passage for Sukkot since the holy day is hardly mentioned). 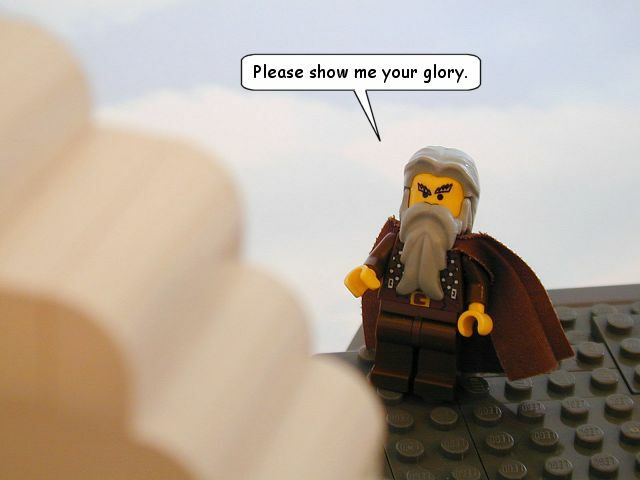 Moses says to God, "show me your glory." And God does. He warns Moses that no one will see God's face and live. So, instead He passes by Moses and shows him His back. Moses' desire is to see the glory of God and God obliges. This is Sukkot: If you want to see God's glory all you have to do is ask; then take the time to sit back and enjoy it. There is an incarnational reality that so many people miss regarding Sukkot. 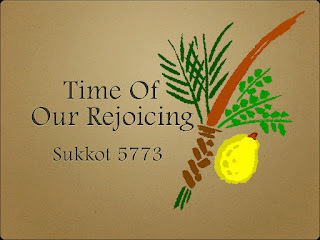 We call Sukkot "the Feast of Ingathering", "the Feast of Tabernacles", and "the Time of our Rejoicing". God's desire is to gather all the exiles back to Himself as a farmer gathers all the crops in the Autumn (feast of ingathering). He wants to "tabernacle" with us. Tabernacle means "to dwell" or "to live" and that is precisely what the God of creation wants to do. He wants us to tabernacle in His presence (feast of tabernacles). He did all this so that we can rejoice in His presence and let the cares of this world fade away (time of our rejoicing). The incarnational reality of Sukkot is that God gives us the opportunity to Sukkot (tabernacle) in His presence. We can take it one step higher in the person of Yeshua. John 1:14 says, "The Word became flesh and made his dwelling [sukkot; tabernacled] among us. We have seen His glory, the glory of the one and only Son, who came from the Father, full of grace and truth." 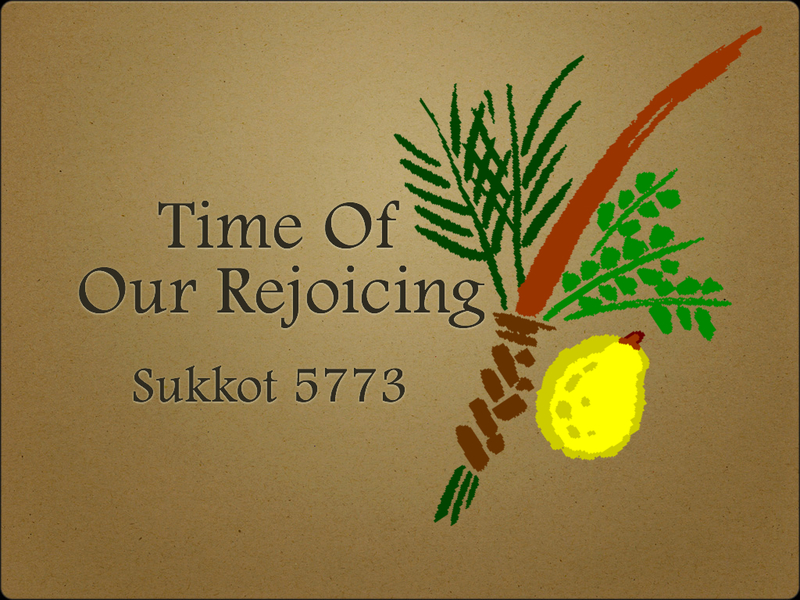 John is using imagery from the Feast of Sukkot. The Word, Yeshua, came to Sukkot among us. Just like we do every Sukkot, John turns to the concept of the glory of God. "We have seen His glory. the glory of the one and only Son..." The incarnational reality of Sukkot is that Yeshua left heaven, was born as a baby, grew in stature and knowledge, and brought the glory of God into a human body (the incarnation). Why would God do such a thing? He was answering the cry of Moses for all of Israel. We say, "show us your glory" and God in His wisdom sent "the glory of the one and only Son, who came from the Father, full of grace and truth." Amazing! Only us (those who call on the name of Yeshua) and the presence of God. During this Sukkot, take the time to sit in the sukkah and enjoy the glory of God. If you don't have a sukkah, no worries; the presence of God will go anywhere and at any time. All you have to do is want to see it and ask God for it. You will have to ask again. But, it is a wonderful picture of all that we hope for. The prophet Zechariah writes (in another special reading for Sukkot), "On that day His feet will stand on the Mount of Olives, which lies to the east of Yerushalayim...Then ADONAI will be king over the whole world. On that day ADONAI will be the only one, and his name will be the only name...everyone remaining from all the nations that came to attack Yerushalayim will go up every year to worship the king, ADONAI-Tzva’ot, and to keep the festival of Sukkot" (14:2-16 CJB). You are a sukkah and you can house the presence of God. Just as Yeshua became the God/Man we, not being God, can have the glory of God reside in us. Just as a sukkah is temporary so, we are temporarily on this earth as foreigners and strangers and the God of Israel is calling us home. He, through Messiah Yeshua, wants to ingather us (Feast of Ingathering), so that He can dwell in us (Feast of Tabernacles) so that we can rejoice in Him (the Time of our Rejoicing)! Chag Sukkot Sameach (Happy Sukkot)! The Asheville Music Festival (AMF), at Deerfield's near Ashveville, NC, was one of the great events of my life. I was incredibly honored to be asked by my friends who planned it to emcee this important event. It was amazing to experience AMF from behind the scenes and from on the stage. To be back stage with all the singers and look out over the whole crowd was simply exciting. 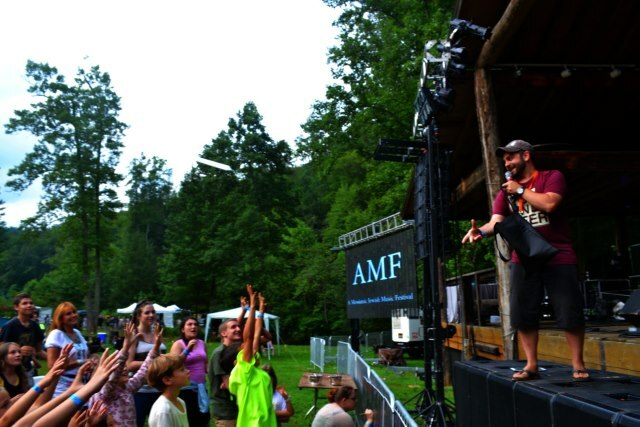 Leading up to AMF I had great expectations of all that the Lord wanted to do in this present generation. Of course some of the expectation was because my wife, Laura, and I traveled by ourselves and left our children with her parents. For us, as a couple, there was high expectation. But also, as a young Rabbi, I had great expectation in seeing, hearing and participating as a voice in my generation. My expectations were met on the first day (Thursday) when a major storm hit. 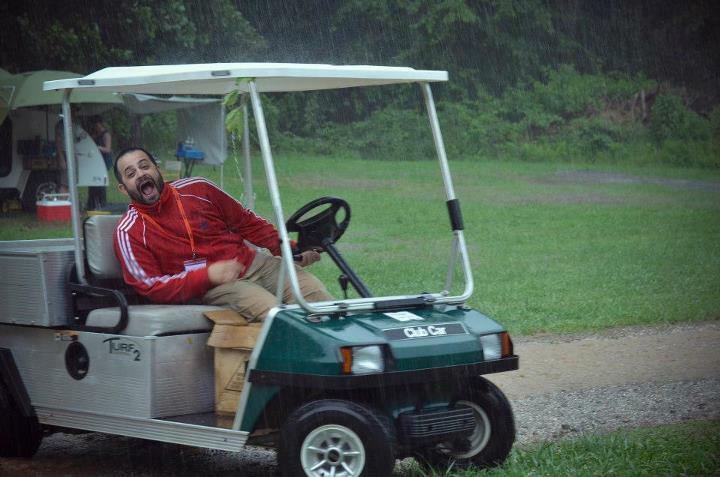 As I drove a golf cart around and helped various people get to their campsite, rain began to fall, mud began to form, followed by hail and rivers of water instead of walkways. Some people began to say, "the enemy is attacking" and it dawned on me that Satan cannot control the weather. Sometimes we attribute things to Satan that are not his. Only the One who created the weather can control the weather. Often Satan is made out to be the arch enemy of God and in a conversation about these things, Jonathan Mahoney said, "Satan's arch enemy is actually Michael the arch angel." Beautiful. There is no one like our God and no one at His level that can be matched with Him. Now, I am not sure why God sent rain and delayed the start of AMF by several hours. But, I am sure He is God and that I don't need to know His reasons. And with the rain I saw people helping each other that had just met. I saw young and old together helping each other move tents that were being flooded. I saw people go to Walmart and buy other people rain boots. I saw a ton of volunteers doing a ton of little jobs to get the event started in the midst of chaos. I saw people in the remote lot (which you had to take a shuttle from) stay down there the entire time so that people could be registered and enjoy the festival. I saw seasoned leaders come to enjoy the festival though they were not asked to speak or perform. I saw young people doing amazing art work. I saw a big dude serving beef ribs, hippies serving vegetarian quesadillas, "trash huggers" taking trash away, and a young sophisticated dude serving coffee of which he knew everything one could know about coffee. I saw an awesome couple that served unreal root beer snow cones! Yes, root beer! I saw a crazy cross section of the world of Messianic Judaism and was excited that it is so much bigger than the circles in which I run. 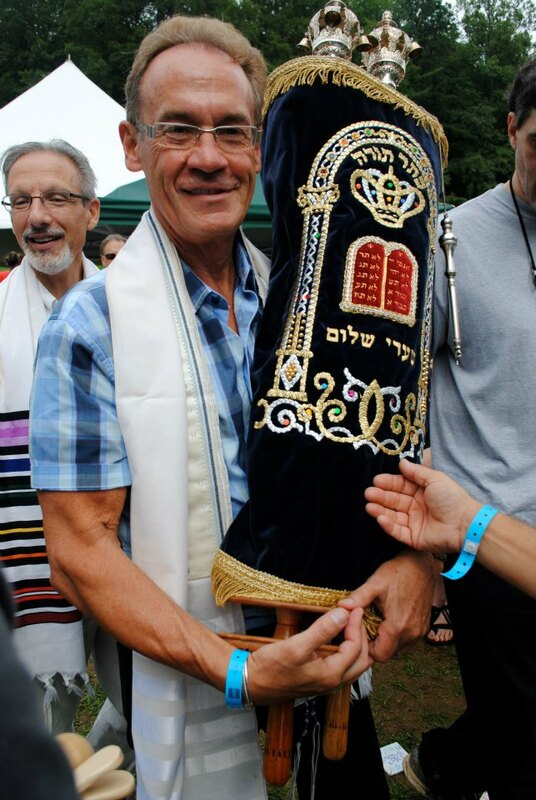 I saw Joel Chernoff and Stuart Dauermann carry two Torah's at the same event in the same Torah service. 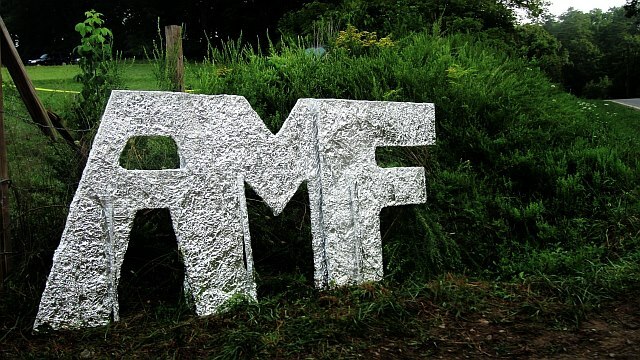 I heard crazy things like "this is the cleanest festival we have ever worked" (trash huggers). I heard, "We are having intelligent conversation because everyone is sober" (coffee guy). I heard bands who had never heard each other’s music talk about working together. I heard an amazing message on Shabbat and a cool analogy of AMF being like Dorothy shifting into technicolor. the message was assisted by Ross Anderson who blew my mind with his memorized reading of the Parsha and how he forced us to imagine Moses receiving the revelation from God and speaking it with the kind of passion that imagine Moses actually spoke. I heard some of my favorite music and was introduced to new music I had never heard before. I heard an awesome choir of AMF musicians lead us in song together on Shabbat morning. And I heard joy when a giant tent was put up to shield people from the rain and sun (when it came out). Most of all there was an excitement in the air because it was our event. It was a festival lead and performed by people of this present generation. It was a festival blessed by our fathers and leaders of a variety of important Messianic organizations. It was a festival that I believe pleased the Lord. It was a festival that will spur our generation to rise up and move forward with abandon with what the Lord has called us do while honoring those who came before us. 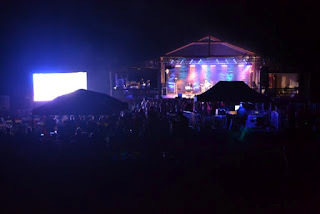 It was a festival to make Messianic Judaism relevant to our generation and to lead our generation in turning to the God of Israel in repentance through the person of our Messiah Yeshua. It was a festival that will spur our current leaders to see value in our generation and no longer treat us as children but as co-heirs, comrades, and partners in the preaching of the Jewish Gospel that our Jewish people so desperately need. As the end of AMF came, a strange thing happened. The order switched for the last two acts. Hazakim went first and Micah Mahoney went last and for me at least they were two of the most powerful performances. Hip-Hop is the music of our generation and it deserves to be highlighted and re-imagined as a Messianic art form. 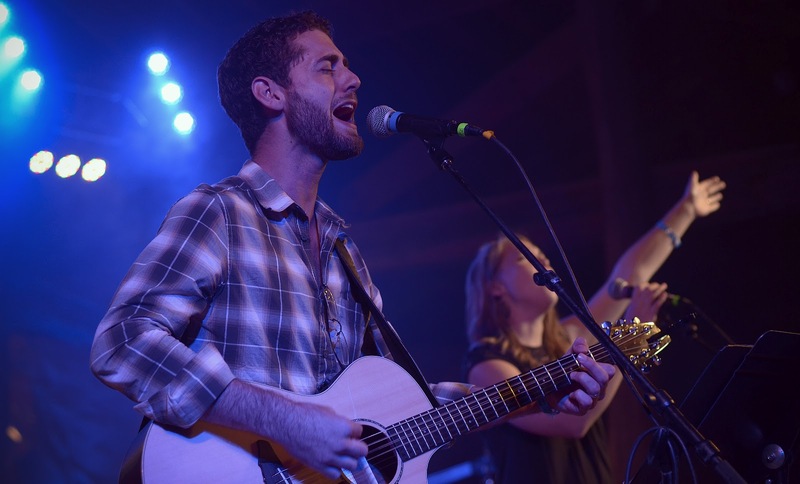 And it was fitting to end with Micah and his band on a note of reverent worship because after all this was a Messianic Jewish Music Festival and it made sense to end worshipping the One who created us and gave the vision for this event in the first place. As my friend, Troy Wallace, and I worshiped and talked on stage, we saw our Rabbi friend go and sit on speakers outside of the lights of the stage and without a microphone. He began to pray. Of course few could hear him so I went to get a microphone and he pushed it away as he prayed. The crowd that was left was forced to quiet themselves and push in closer to hear. I then understood what Seth was doing. Spontaneously people began to pray, young and old together. It seemed to be the best way possible to end the festival. After all, the whole heart of AMF was to bring people together to celebrate through music, dance, art, drama, sight and sound -- all these things that God has given our generation in abundance. I shared something in the midst of all these things that seems to have resonated with many people and I want to share them here as well. As a young Rabbi in a predominately old movement, I can't tell you how much I love my dad (Rabbi David Rosenberg) and his generation. I can't tell you how honored I am to carry the mantle of leadership that has been passed down from generation to generation. It has often been said to me in terms of rising up to lead this movement by seasoned leaders, "you will have to wait until some of our leaders die before you can take your place." From my heart, as a voice in my generation, that is the last thing we want. We are not asking for a torch to be passed to us so that we can be lone runners moving forward. We, this present generation, want to stand with those who have come before us. We would rather hold the torch with you, lead with you, preach on the same stage as you, sing with you and continue to learn from you and have you learn from us. 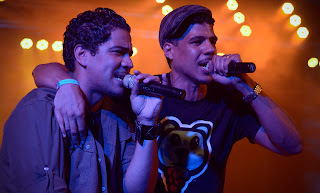 We continue to sing your songs and want you to sing ours. We continue to hear you preach and want you to hear us preach. We want this to be about us together, many generations together, working together to reach many generations -- together. Not just "us" as in your generation. Or "us" as in this present generation. But, "us" as in many generations together sharing the message of the God of Israel with our people and leading them in repentance through our Messiah Yeshua -- together. 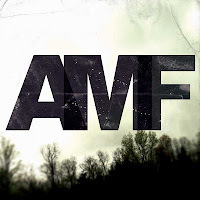 So many people wanted to know if there will be another AMF. 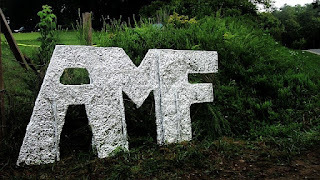 As far as the vision for the festival goes, it was the only one. I see the wisdom in this though I long for this festival to repeat every year. But it has happened. A shift was made that is bigger than you and me. It is bigger than one generation or another. A shift was made because AMF gave this present generation a voice. And leaders of the older generation were there to support it, see it and hear it. It was loud. It was heard. And we all, close to a thousand of us, saw it -- together. AMF changed me. AMF changed the Messianic Jewish Movement. And those who planned it will be blessed to know that, though some of the change cannot be measured, much that is still to happen in this present generation will point back to this important Messianic Jewish Music Festival! 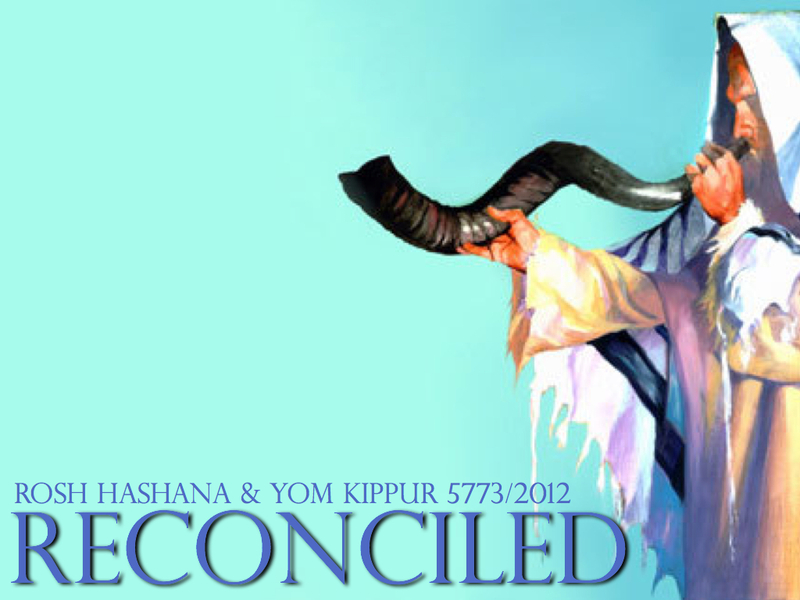 This coming Shabbat is an important day on the Jewish calendar called Tisha B'av (9th of Av). Av is a month on the Jewish calendar and it is the 9th day. Throughout Jewish history this has become a notorious day because, according to Jewish tradition, both Temples (one in 586 B.C.E, the second in 70 C.E.) were destroyed on this same day. It is also the day that the 12 spies returned from spying out the promised land and ten of the spies gave an "evil report" to Moses and the children of Israel. In modern history the 9th of Av was the day the first crusades were declared by Pope Urban II in 1095 which led to thousands of Jewish people slaughtered in the name of Christ. It was also the last day Jewish people could leave Spain during the spanish inquisitions of 1492 or face certain death. I believe, as we will discuss over the next 8 weeks that Yeshua was immersed by his cousin John in the Jordan river on the 9th of Av. It starts what is a 40 day fast for Yeshua as he travels into the wilderness faces HaSatan and returns to his hometown of Nazareth and declares to the world that he is the one we have been waiting for. 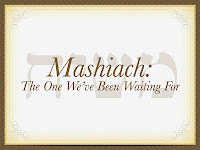 This Shabbat, on the 9th of Av, I will begin the new sermon series, "Mashiach: The One We've Been Waiting For" and we will talk about all the awesome things Adonai has revealed through His son Yeshua and all that our Messiah fulfilled in these important weeks leading up the celebration of Rosh Hashanah, Yom Kippur and Sukkot in September. I am expectant that God will do awesome things in our congregation and our lives as we take time to focus on the visible image of the invisible God, Yeshua. After all, he is the one we've been waiting for! want to listen to the series? it begins Saturday, July 28th, 2012. Click here to listen. What the Heck is an Omer and Why Count 50 Days of Them? The Days of the Omer (omer is a biblical measurement of grain) are so awesome but so many followers of Yeshua seem unaware of this awesomeness. Perhaps they are unaware because they have never heard of the Days of the Omer. Perhaps they are unaware because they include these days in their theology that teaches these things have been replaced by something new. Perhaps they are unaware because they have never noticed these days in their Bibles. The Days of the Omer are commanded in the Torah as a period of fifty days that we count between Pesach (Passover) and Shavuot (Pentecost). In Leviticus 23:15-22 we find one of several places that give instruction for these important days. They are a part of the harvest celebrations which include Pesach, Shavuot, and Sukkot (the Feast of Tabernacles in the Fall). Each of these holidays celebrate different parts of the harvest that God has given His people. Most followers of Yeshua have heard of Passover and have participated in some kind of Passover Seder but many have never heard of Shavuot or Sukkot. It is an interesting phenomenon because all three are so important in Scripture. Often it is said that Yom Kippur (Day of Atonement) is the most important day on the Jewish calendar but this is simply not true. The most important day on the Jewish calendar happens to fall once a week and is called Shabbat. Following Shabbat the three harvest festivals are the only holy days which require a visit to Jerusalem to bring an offering of thanks to the Lord. Then comes Rosh HaShana and Yom Kippur. The importance of Pesach and Shavuot is underscored by all that God has done for His people during these days. Pesach is all about freedom: freedom from Egypt -- freedom from sin and death. In the Torah, the exodus of Israel from Egypt takes place during Pesach. In the New Testament, the death and resurrection of Yeshua (Jesus) takes place during Pesach. Following Pesach and during the counting of the Days of the Omer, there are so many wonderful events: the parting of the sea of reeds, the giving of manna from heaven and the providing of quail from the East. Yeshua appears resurrected to His disciples during these same days. He appears to Peter, Thomas, John and over 500 witnesses that saw Him alive after He was put to death (a period of forty days, Acts 1:3). One of the most important days on the Jewish calendar (and most unrecognized) is the fortieth day of Omer. This is the day that our Messiah Yeshua ascended into heaven to take His place at the right hand of God! This is the day that Yeshua, Who humbled Himself by coming lower than the angels and in a human body, takes His sacrifice to the real Holy of Holies. The real Holy of Holies that the Tabernacle and Temple were only copies or "shadows" of. This is the day that Yeshua took His place as victor over sin and death, as King of Kings and as Lord of Lords. The fortieth day of Omer is an awesome day! All through the fifty days of Omer all of Judaism prepares itself for the receiving of the Torah on Mt. Sinai on Shavuot. 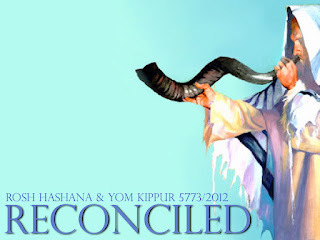 As a Messianic community we are also preparing for the receiving of the Ruach HaKodesh (Holy Spirit) given on the very same day, Shavuot, as recorded in Acts 2. What is typically understood as the start of the "church" is actually a bunch of Jewish people following the commandment to be in Jerusalem to bring free will offerings to the Temple on Shavuot thanking God for all that He has done! When I have attended churches and listen to Pastors preach through podcasts, so many say things like "we need to focus on Jesus" and "we need to be more like Jesus". It seems to me that the fastest way to be like Jesus is to do what He did: to not ignore these days but celebrate them just like He did; to recognize all the awesome things God has done during these important days because He wants relationship with us and to give Him the glory that only He deserves because He is awesome! There is no greater time on the calendar to celebrate all that God has done for His people than during Pesach, the fifty days of Omer, and Shavuot! These days are awesome because the God of Israel is awesome. These days are awesome because we need reminders in our lives that there is no one as awesome as our God! These days are awesome because they remind us of the awesomeness of Who God is and the awesomeness of all that He has done for those who call on His name! For more on Shavuot read: Why I Don't Eat Dairy on Shavuot! The latent antisemitism of "Hebrew Roots"
The term "Hebrew Roots" is used by various Messianic groups and Christian "Hebrew Roots" churches. It can mean a variety of things and each group does not define the term the same way. Some "Hebrew Roots" congregations, while seemingly well meaning, have within them latent antisemitism. I use the word latent because I do not think the antisemitism is intentional but nonetheless between the lines it is there. For years now the main stream Messianic Jewish Movement has been fighting against "replacement theology" in Christianity. Replacement theology broadly defined is the idea that the Gentile Church has replaced Israel and the Jewish people as the people of God. This is a destructive theology because it misrepresents the intentions of God to save the world through our Messiah Yeshua and the responsibility of His Jewish followers to share the Jewish message of the Jewish Messiah with Israel and the nations. In many cases, not all, "Hebrew Roots" proponents replace Israel in a different way. That is to say not that the Church replaces Israel but that all Gentiles are Jews through the tribe of Ephraim. It takes away the distinctiveness of the Jewish people which was given to us by God. God called Abraham out of the nations to make a new nation that would lead the way in understanding and following the Creator of the universe. All through the book of the prophet Isaiah, he calls the Jewish people to be a light to the nations -- not to convert them to Judaism but to show them the God of Israel. In attempting to take away Israel's distinctiveness, some Hebrew Roots teachers are leading people into latent antisemitism and teaching Gentiles to cleanse themselves from being a Gentile. The Apostle Paul directly speaks to this in his first letter to the Corinthians : "Nevertheless, each one should retain the place in life that the Lord assigned to him and to which God has called him. This is the rule I lay down in all the churches. Was a man already circumcised when he was called? He should not become uncircumcised. Was a man uncircumcised when he was called? He should not be circumcised. Circumcision is nothing and uncircumcision is nothing. Keeping God’s commands is what counts. Each one should remain in the situation which he was in when God called him (1 Corinthians 7:17-20). In my experience in ministry many Jews and Gentiles misunderstand the word Gentile. It is not a curse word or something bad. It simply means "nations" and God's desire is to bring all people back to himself (what we call the "model of return"). In Revelation John writes concerning Yeshua, “You are worthy to take the scroll and to open its seals, because you were slain, and with your blood you purchased men for God from every tribe and language and people and nation. You have made them to be a kingdom and priests to serve our God, and they will reign on the earth" (Revelation 5:9-10, italics mine). Wow! Every tribe, language, people and nation. How could John recognize all of these different peoples and nations if they all looked the same and all came from one nation. Being from the nations (a Gentile) should be celebrated and honored not treated as a curse word or something to run away from. Yes, often the scriptures tell the Jewish people to not be like the Gentiles around them. But, what if those Gentiles turned to the God of Israel? This is not about Gentiles becoming Jews it is about the nations (Gentiles) turning to the one true God. For me, the issue is identity. No one should be telling Jews to become Gentiles or Gentiles to become Jews. God didn't make a mistake when He birthed you in your particular family and with your particular background. When we mess with identity we mess with God’s design. All of us, Jews and Gentiles, were made in the image of God and our stories and the families we come from are a part of His plan and design. In teaching the New Testament we should not use the term Hebrew roots because the whole message is Jewish. Not just the roots. The idea that the world needs a savior, a sacrifice for sin, and an anointed one (Messiah in Hebrew, Christ in Greek) is Jewish. When a Jewish person believes in Yeshua we remain Jewish. When Gentiles believe in Yeshua they remain Gentile. Together we form the body of Messiah, one olive tree (Romans 9-11) held together by the Messiah Himself. The tree is Jewish with both natural Jewish and grafted-in Gentile branches. Gentiles who believe that Yeshua is the Messiah are grafted into the commonwealth of Israel but do not become Jews. Jews who believe in Yeshua remain in Israel and maintain their Jewishness (for an amazing discussion on this see David H. Stern's book "Restoring the Jewishness of the Gospel"). The latent antisemitism is signaled when a Hebrew Roots group uses language like "uniting the two houses of Israel" and makes statements like "for two thousand years we have been taught that Israel is the Jewish people and that the Jewish people are Israel. This misunderstanding has crippled our ability to glean the scriptures." Friends, there is no misunderstanding. Israel is the Jewish people. The Jewish people are Israel. Gentiles are grafted into the commonwealth of Israel (Ephesians 2:11-16) without becoming Jews. They remain Gentiles. According to the decision made by the original disciples of Yeshua at the Jerusalem council (Acts 15), Gentile observance of the Torah is different than that of their Jewish counterparts. In God’s eyes there is no difference between Jews and Gentiles. Both are only saved by faith in Yeshua. After salvation, the moment of accepting Yeshua, our lives look slightly different in terms of how we observe scripture. Yet, our stories are similar because we all fall short of the glory of God (Romans 3:23) and we all need Yeshua to gain eternal life. Then, together, we fight for the whole world, all Jews and all Gentiles, to see the awesomeness of God and what He has accomplished for us in the death and resurrection of His son, Yeshua. If you are a Jewish believer in Yeshua, don't give up your Jewishness. If you a Gentile believer in Yeshua, don't give up being a Gentile. Don't be fooled by the destructive teaching of some of these "Hebrew Roots" groups that want to confuse your identity and claim it is in search of the truth. Don't buy into the teachings of some "Hebrew Roots" groups because their production is beautiful and the presentation is pretty. Dig in. Search it out. Make sure the teachings are not trying to turn you into something God didn't create you to be. Don't buy into any theology that tries to take away the distinctiveness of the Jewish people or any people. The truth is that God made you with an awesome plan for you. If you don't know who you are and you accept ideas that make you think you are something you are not, then you will accomplish nothing. Find your value in who you are! Your family background and your family heritage ought to be celebrated when you come face to face with the God of Israel. He doesn't make mistakes and He didn't make one with you!